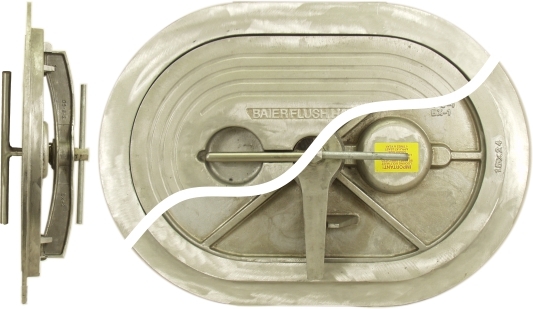 The Baier T-Handle watertight hatch is a “No Tools Required” Hatch. This marine hatch Has a Built in T-handle turnbar to open and Close. Unlike our Standard Hex Center bolt Hatch, which uses a separate wrench to operate, this hatch has all parts needed for it operation contained in the hatch and still remains flush to the deck. Standard equipment on many fish boats, tugs, barges, work boats, and other marine vessels and many US Navy and US Coast Guard vessels. Newley redesigned T-handle assembly alows more tourque to be applied with out damage.